The new CLAAS Lexion 700 Terra Trac series has been well received in North America since its introduction last year. Most notably the machines equipped with the new territory has an advanced track undercarriage that features independent front suspension that actually contours with the changing terrain to ensure a more comfortable and effective ride less stress on the operator. The APS Hybrid System essentially forms the crop yields through the combine at optimized rate with industry-leading threshing and separation area. The end result is a higher throughput capacity, a higher drain quality and particularly careful straw handling. Among advanced combine harvesters, all Claas Lexion 700 models comply with the Stage IV (Tier 4) emissions standard by means of SCR (Selective Catalytic Reduction). This process converts the nitrogen oxides in the exhaust flow into pure nitrogen and water. The urea solution necessary for this is carried in an 80-litre tank. In addition, EGR (Exhaust Gas Recirculation) is used to mix a proportion of the engine exhaust gas with the intake air. This reduces the combustion temperature in the engine which in turn largely prevents the formation of nitrogen oxides. 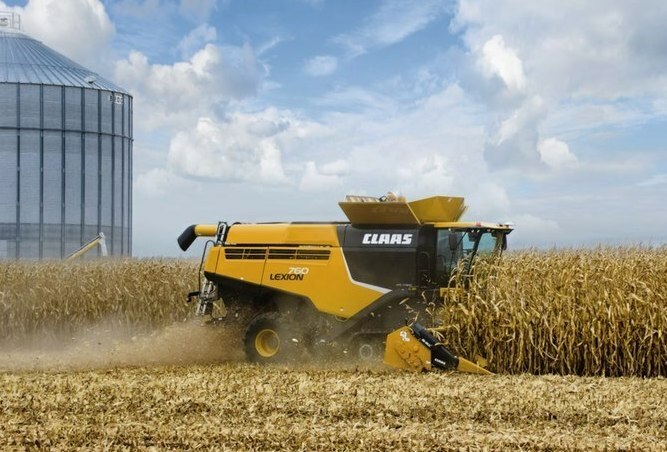 All Claas Lexion 700 models are equipped with a horizontal cooling system situated behind the engine compartment. A large rotating sieve with a diameter of 1.6 metres ensures that it is able to pull in sufficient cool and clean air at all times. Permanent cleaning is performed by an automatic dust extraction system. The large radiator package has sufficient reserves to ensure continuous cooling while also maintaining the entire cooling system and air filter clean longer. 0 Response to "Claas Lexion 700 Series - Combine Harvester"